Italy’s most famous porcelain factory, Capodimote was founded by Charles IV, King of Naples (later King Charles III of Spain) at the royal palace of Capodimonte in 1743. 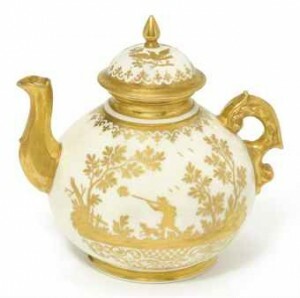 Charles wanted to create porcelain production to match the Meissen factory. Pictured left: A Capodimonte (Carlo III) Teapot And Cover Circa 1747-52, Blue Fleur De Lys Mark sold at Christies, London, 24 May 2011 for £133, 250 ($214,133). Image Copyright Christies. Indeed, Capodimonte porcelain initially had strong influences from Meissen and Vienna with its own distinctive fine white, translucent design. The Capodimonte factory produced many wares but have become well known for their figurines. Their most famous modeller was Giuseppe Gricci was famed for his Commedia dell’ Arte and peasant studies. A particular of Gricci and Capodimonte was the use of disproportionately smaller heads on models. 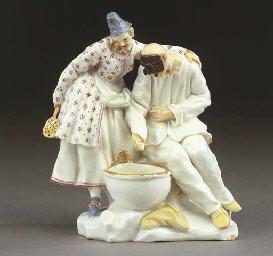 Pictured right: “COLUMBINE AND PUNCH eaters – Colombina E Pulcinella Mangiamaccheroni” Capodimonte porcelain, about 1750 by Guiseppe Gricci sold at Christies, Milan, 10 June 2002 for E133,950 ($126,234). Image Copyright Christies. Guiseppe Gricci took inspiration from one of the paintings that the artist Gian Domenico Ferretti performed after seeing the shows that focused on “The thirty-two misfortunes of Harlequin” kept by a company of Comedians in Florence in 1742. Ferretti is portrayed in the painting by Colombina Arlecchino that rejects violence, but according to his feeling Gricci idealize the situation and replaces intuition with the Harlequin Punch Neapolitan mask portrayed tenderly embraced by Colombina. In 1759 Philip V of Spain died and Charles took up the Spanish throne. He moved the factory, all moulds, models and artists to Buen Retiro in Madrid. The early wares from the new factory were very similar to those of Capodimonte. The factory began to concentrate on figurines. Production in Buen Retro continued until 1812. Charles’s III son Ferdinand became King of Naples and in 1771 he revived porcelain production in Naples with particular emphasis on Bisuit figures, Classical groups and wares featuring Naples and Mount Etna. For fifty or so years Capodimonte had produced some of the finest porcelain figurines, ceramic dinnerware and ornaments in Europe. Today there is much confusion as Capodimonte porcelain is still being produced by factories in Italy. These should not be confused with the 18th Century Capodimonte.